A motionless matchstick grasshopper does its best to pretend it is part of a plant. Bug of the Week continues its adventures in warmer realms with a return visit to the land down under, where last week we met the spectacular Dendrobium beetle on an island near the Great Barrier Reef. Clusters of gorgeous jewel bugs gather on trees at Katherine Gorge in Australia. A bit further down the mountain from a beetle-infested patch of orchids, grazing on the leaves of a small shrub, was the bizarre herbivore known as the matchstick grasshopper. 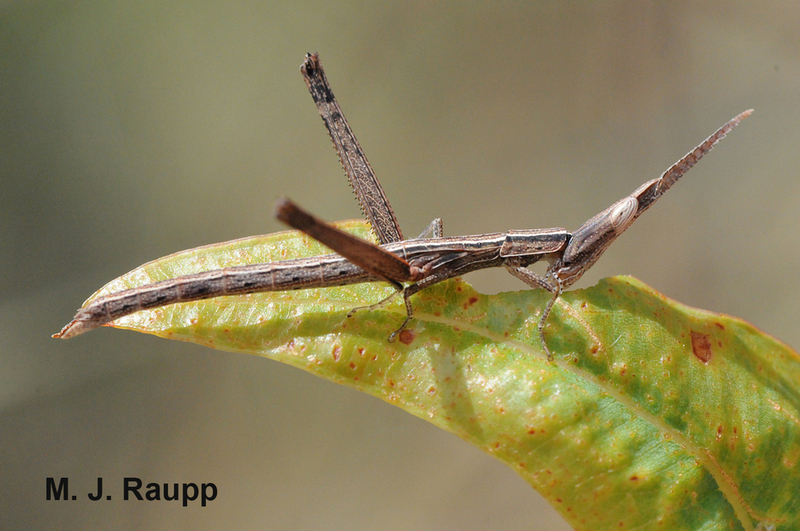 These small plant feeders are relatives of more well-known orthopterans such as locusts and katydids. Leaves of trees, shrubs, and grasses are the primary foods of this group of tiny grasshoppers. Due to their largely nocturnal habits, we were truly fortunate to spy one of these petite monsters during the daytime. An incredibly long and slanting head with tapered antennae complete the look of a slender stick and enable the grasshopper to blend with twigs and branches of the plants it consumes. When disturbed by an excited bug geek with a camera, the grasshopper froze in place, apparently doing its best to convince me that it was simply part of a plant. This ruse is often used by other members of the grasshopper clan and their close relatives, like walking sticks and katydids. The next stop on our Australian adventure was the outback near Kakadu National Park. Days in the outback can drive students and faculty a bit crazy. At a rest camp at Katherine Gorge, broadleaved trees were festooned with clusters of brilliant metallic bugs standing shoulder to shoulder on the undersides of leaves. These particular insects, green jewel bugs, are members of the true bug clan (Hemiptera) that includes such scoundrels as the brown marmorated stink bug. Unlike stink bugs, an elongated, shield-like hindwing covers the entire abdomen of the jewel bug. The dazzling colors of these plant feeders are formed by pigments stored in their exoskeleton or by clever manipulation of light rays as they pass though different textured layers of their cuticle. This type of coloration is also used by some leaf beetles we met in previous episodes of bug of the week (Gold in the meadow, the dogbane beetle, Chrysocus auratus). The brilliant colors of the jewel bugs likely serve as a warning to would-be predators to stay away. Like their cousins the stink bugs, jewel bug nymphs and adults can release a smelly witch’s brew of noxious chemicals when threatened by predators or nosey entomologists. While repugnant to potential predators, jewel bugs may be benevolent to their own kind and dutiful mothers of several species exhibit maternal care of their offspring.